There are just nights when you crave for a particular snack and tonight is one of them and I'm craving for some pizza. And not just any pizza, but, particularly, the Meaty Barbecue pizza from Angel's Pizza Pasta Combo. I had a chance to try Angel's Pizza's Meaty Barbecue promo at their branch in Eton Cyberpod along Ortigas Avenue, in front of Robinsons Galleria. Bundle 1, which is good for 2 persons costs PHP 439 and you get 1 medium meaty bbq pizza, 1 cheesy lasagna and a 1.5-liter Coke. Bundle 2 is good for 4-6 persons costs PHP 569 but you get a family (12-in) meaty BBQ PIZZA, an order of thier wild wings, and a 1.5-liter Coke. Bundle 3 is good for 8 and is what we tried. It has 1 big family meaty bbq pizza, an order of buffalo wild wings, cheesy lasagna and a 1.5-liter Coke for only PHP 750. 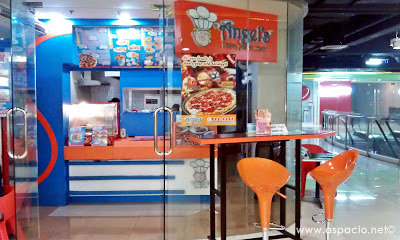 For Angel's Pizza (www.angelspizza.com.ph) deliveries you can call 922-2222 and like Angel's Pizza, Pasta, Combo on Facebook (www.facebook.com/angelspizzapastacombo). I haven't tried Angel's Pizza yet. Their pizzas and buffalo wings look tempting!